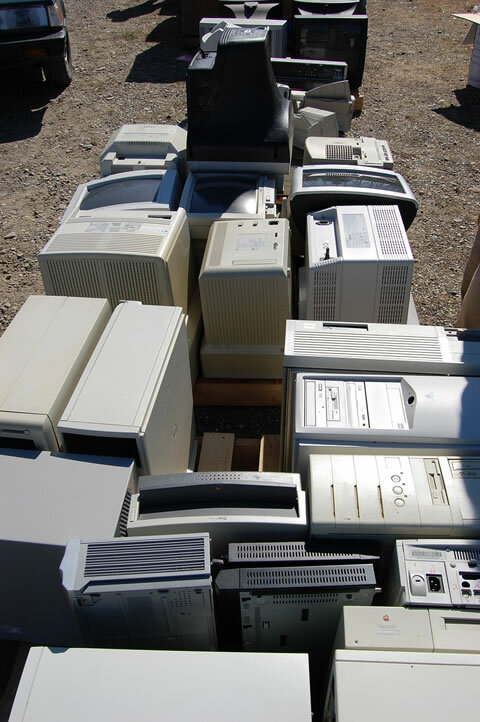 When moving in San Diego, many people ask our San Diego movers where to recycle computers, lap tops, televisions, stereos, telephones, old fax machines, printers, scanners, copiers, microwaves, cell phones, VCRs and DVD players before they move. Great question, because you can not throw these items in the trash! Many people do not know that you should not throw out e-waste products before you move, and it is actually is against the law. The reason is throwing out e-waste produces toxic chemicals and is very bad for the environment and not good for people’s health. It was determined in 2001 that the tubes contained in video devices had large amounts of lead in them when disposed. They also have other toxic materials such as mercury, flame retardants and POVC coated copper wire. This is harmful to people’s health. -70% of metals in landfills are from e-waste. -People in the US throw out 130,000 computers each day! What to Do With Your E-Waste Products Before You Move? Before your San Diego movers arrive to move your home, it is a good idea to either give your e-waste products away that you don’t want, or recycle them. Where to Go to Recycle E-Waste Products in San Diego? Recycle San Diego is an organization that recycles e-waste products. They have trucks that will come to your house for a fee, or you can dispose of your e-waste at their location. Hours: Monday-Friday from 8:30am to 4:30 pm.